Did you ever wonder what a caper is? You’ll find these pickled orbs in a variety of dishes but they’re usually in the background and you’ve probably never thought about where they come from. I knew of their origin at some point, but I’d forgotten so I did a little research for this post. As it turns out, capers are the flower buds of the caper bush. Native to arid climates, including the Mediterranean, East Africa, and Central Asia, the Capparis spinosa bush flourishes in rocky areas and tolerates clay, sandy, and rocky surface soils. The unopened flower buds are picked by hand, dried in the sun and fermented in a salty brine or vinegar solution. Capers range in size from that of a peppercorn to a small olive. The fruit of the bush, called caper berries, grows to about the size of an olive and are brined in much the same way as their smaller siblings. Capers enhance many Mediterranean dishes, such as Chicken Piccata and Puttanesca Sauce and can be used as a flavor enhancer or a garnish. I ran to Whole Foods yesterday to pick a couple of things but I was hungry and as always, items kept ending up in my basket that were not on my shopping list. I Whenever I walk past the herbs, dill always catches my attention. I’ve always thought it was beautiful plant and I love its fragrance. As I picked up a fresh-looking bunch, my mind immediately flashed to my grandmother’s delicious dill pickles from my childhood. I also thought about how much I love fresh grilled salmon with this wonderful herb. I was in the mood for a light lunch, so I decided I’d make a shrimp salad with dill. When I got home and opened the fridge I grabbed some capers, mayo, lemons, onion, celery, and romaine and minutes later, I was enjoying the perfect, light lunch. This versatile salad is low carb and paleo-friendly. 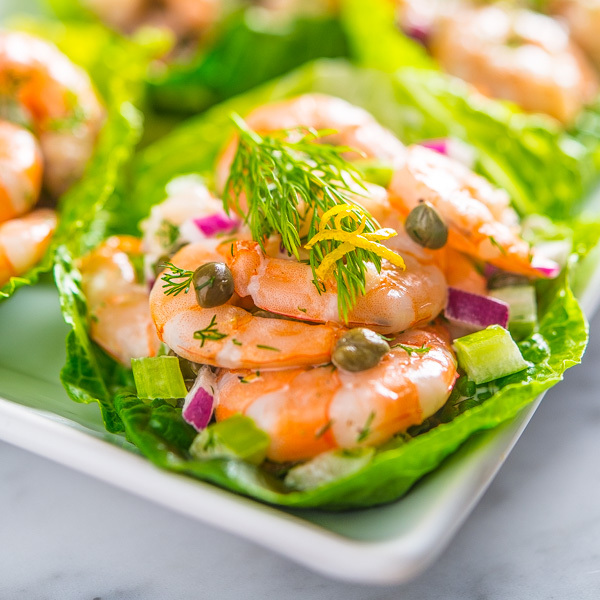 The tartness of lemon and capers with the sweet flavor of shrimp play off of each other beautifully in this dish and the onion and celery provide the perfect amount of crunchy texture. Serve this salad for a light lunch or as an elegant appetizer for a dinner party. If you like shrimp, I promise you’ll like this salad. Combine all ingredients and serve in lettuce cup. Garnish with lemon zest and dill fronds. This is such a nice, fresh-tasting recipe! I love capers and I love dill. Not to mention shrimp. Really good stuff — thanks. What a fabulous salad and perfect lunch – light and delicious! I go through a bottle of capers quite quickly and I can see how they would be awesome in this salad! I adore shrimp and this salad is seriously calling my name!